One idea relevant to the Veblen House is the Fix-It Club. The Fix-It Club concept involves rescuing stuff headed for the landfill that deserves a second life. Participants bring stuff that can be easily repaired to a workshop, and share tools, knowledge and conversation while fixing the stuff up. On June 17, we had our first Fix-It Club meeting in my garage. Here is the "diagnostic center"--a solid oak table I rescued from the curb that's in need of a bit of glue. 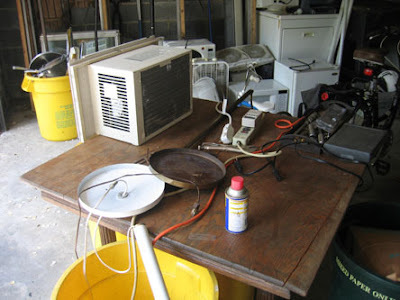 In the meantime, it's a handy surface for setting tools, abandoned A/C units, lamps and what have you. A Kill-a-Watt meter allowed us to measure energy use of the various items. 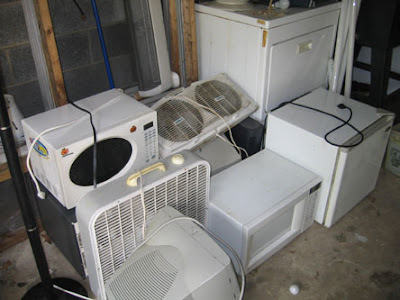 A couple hours of light work, expedited in particular by my neighbor Mark, who has insight into electronics, expanded our inventory of functional items to two microwaves, a mini-frig, two computer monitors and two lamps. A couple fans also turned out to work just fine, but still need cleaning. Liz and Jill came by to help out. There is, of course, the question of how to find these items new homes. But the front side of the project--the rescuing and repairing--turns out to be straightforward and rewarding. 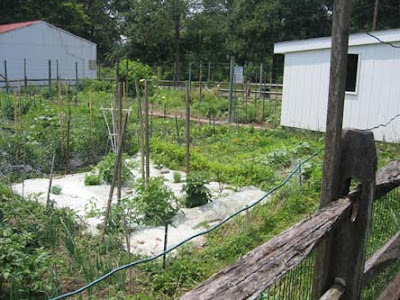 Seeing as this is a website about efforts to restore the Veblen House and develop a vision for the farmstead, it might be a good idea to actually include a photo of the Veblen House. 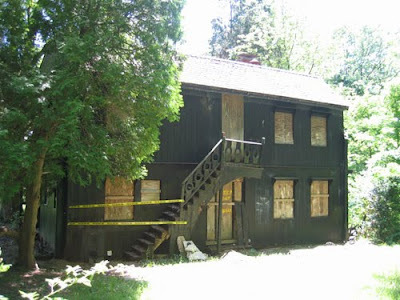 Here it is from the side, in all its boarded up glory. Though the house has not been occupied for eleven years, and shows it, the European touches are still visible in the stair railing and in the woodwork inside. 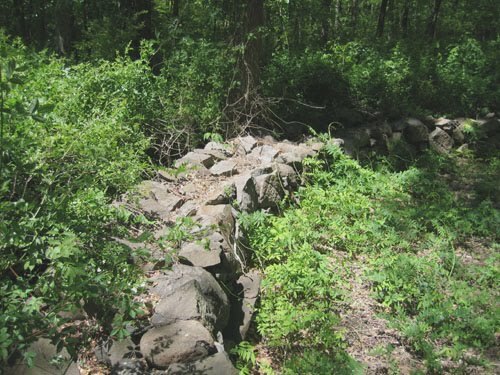 Next to the house is a horse run--essentially a very well-built circular wall in which horses were once exercised. Andrew Thornton is in the process of removing the wisteria that has run rampant over this area. Beyond the horse run is the footprint where a large barn once stood, now grown up in trees. In the absence of human occupation, nature has moved in. 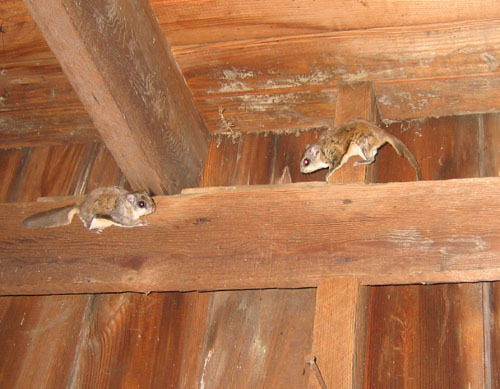 Though the flash on my camera makes them look like exhibits in a museum, these are a couple of the flying squirrels found living in the small barn a month ago. This past Sunday, some progress at Veblen House. Andrew and I first installed a better ladder for accessing the basement. In keeping with the sustainability theme of the project, the ladder was rescued from the curb and is being given a second life. The situation in the basement is something of an emergency. The floor joists are dripping wet from the humidity. One can see where runoff from outside flowed in through a vent, most likely from roof runoff that falls next to the foundation for lack of gutters. In an email, architect friend Heidi recommended covering the bare dirt in the crawlspace with plastic. I've also put in a request to the county for roof gutters (the old copper ones long ago disappeared, probably stolen for their metal). In the meantime, it will be necessary to cover the ground next to the foundation with plastic so that the water pouring off the room during heavy rains can flow away from the house. 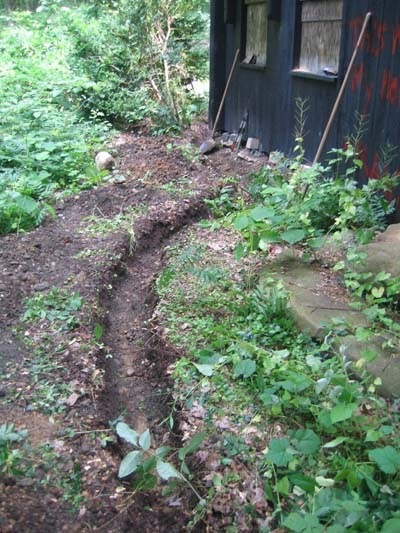 The step taken on Sunday was to dig the beginnings of a ditch to carry water away, so that at least it will not flow into the basement. One idea Andrew had for the open field next to the Veblen House is a community garden. We visited the existing one nearby at the township's Smoyer Park, which may or may not be maxed out.